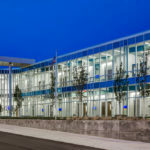 Kalamazoo, Michigan, has a consolidated all its family court functions into one new 81,200-square-foot facility. 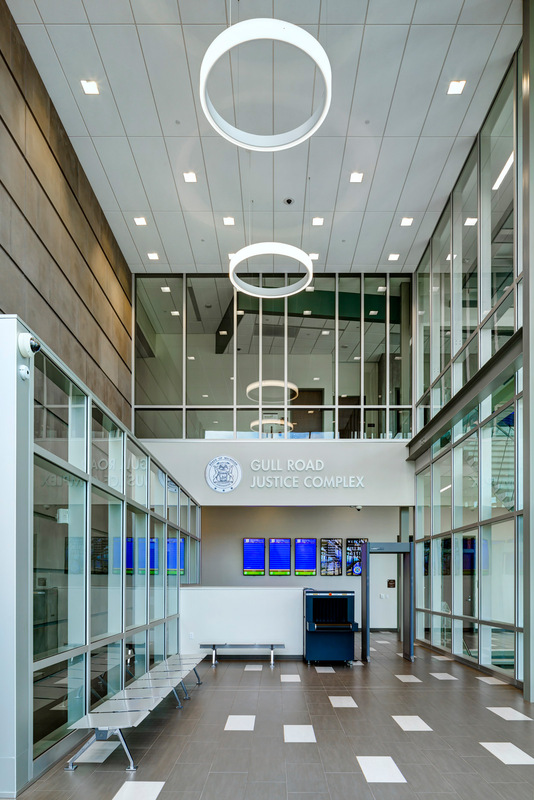 Designed by New York-based HOK, the Gull Road Family Justice Complex brings together juvenile functions, domestic relations, probate, prosecuting attorneys, clerks and family support services. The new natural light-filled project takes advantage of its site’s steep ridge. 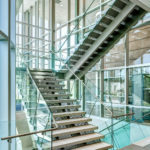 A two-story insulated curtain wall lines the buildings the public corridors. Courtrooms, hearing rooms, offices and conference rooms are lit by clerestory windows and borrowed light. Brick facades with punched windows reference the projects surrounding residential community and the neighboring juvenile center. 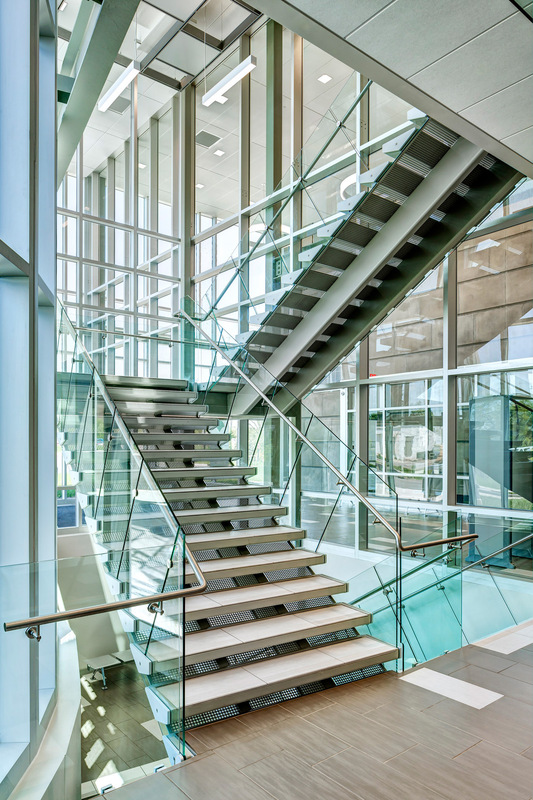 A two-story glass atrium and three-story open staircase bring the public into the building. 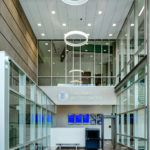 The complex’s four courtrooms, jury deliberation area, and the prosecuting attorney’s office are on the buildings upper floor. 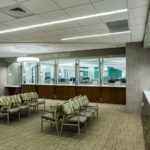 Discrete holding areas and a secure connection to the neighboring juvenile facility are separated from public, judge, and staff areas. The facility integrates the latest in court technology. 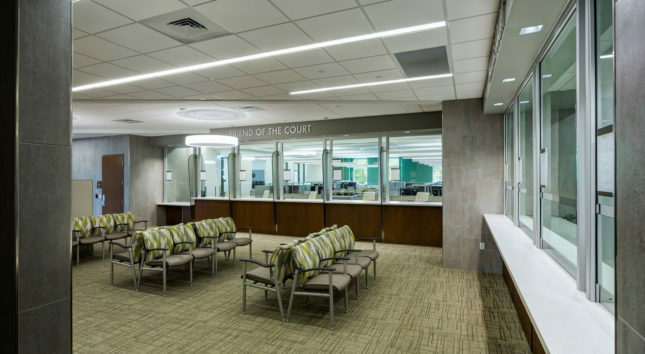 All courtrooms and hearing rooms are equipped with integrated audio/video recording equipment, video conferencing technology, evidence presentation technology, and sound reinforcement. This system allows for reporters to monitor court proceedings from outside of the courtroom. The lobby also includes monitors outside courtrooms. 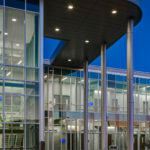 HOK led programming, planning, and design on the $20.1 million project, with Grand Rapids, Michigan-based TowerPinkster managing the project and serving as architect of record. TowerPinkster also handed mechanical, electrical and plumbing engineering. Funding for the project came from state revenue and money saved by the circuit court over recent years. 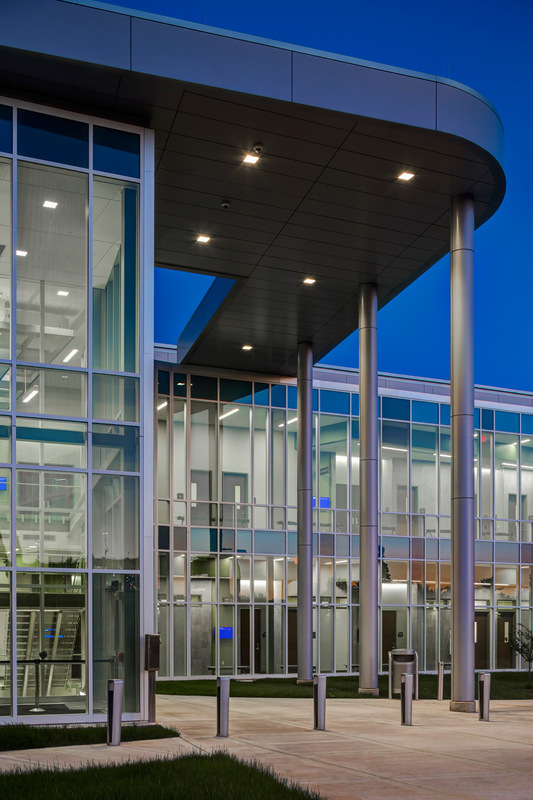 The new facility is designed to improve operational efficiency and security, while anticipating future needs of the court system.